January - It is cold and rainy and one of my students has brought a lovely photograph to my Tuesday morning on-going Adult Education class. It is of a skylight, with trees behind it and hot red leaves laying on the icy, rainy, skylight. I started with a base fabric, with a layer of Bonding Agent 007 (powdered fusible webbing). I fused together little bits of fabric for the trees, bubbled cellophane for the ice, Angelina fibers to add shimmer, then tulle and opalescent organdie, then photo transferred leaves. March - The most unbelievable thing has happened. I have been selected Teacher of the Year by The Professional Quilter magazine. I went to an Art Fair over the weekend and saw a sign that said: “If I could step out of my body, I would burst into blossoms.” That’s how I feel, and what I made a quiltlet of, using fabric woven of metal, fused flowers, and fabric paints, with a ballet dancer gradually becoming filled with flowers and leaping in joy. May - My son is getting married on May 31, the day after his birthday. 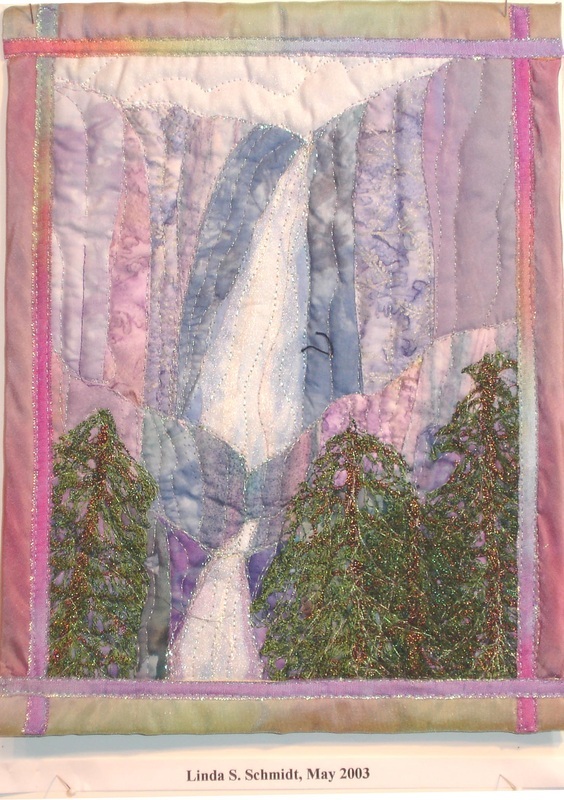 I thought I was off the “quilt hook” since I bought his ticket to Jamaica, but was informed two weeks before the wedding that he and his bride still expected a quilt of Yosemite Falls for their wedding present. Amazing what we can accomplish, when pressed, isn’t it? The 48” x 60” quilt did get done. 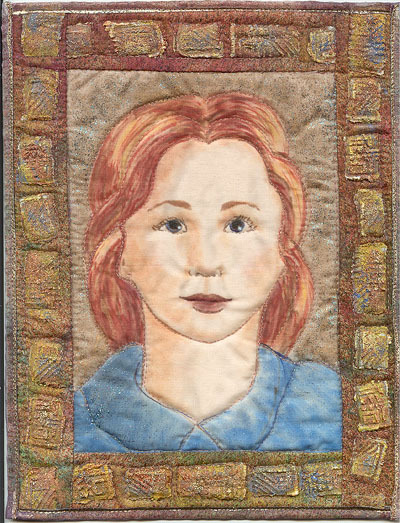 Here is a miniature of the quilt I made for Mike and Roxanne. 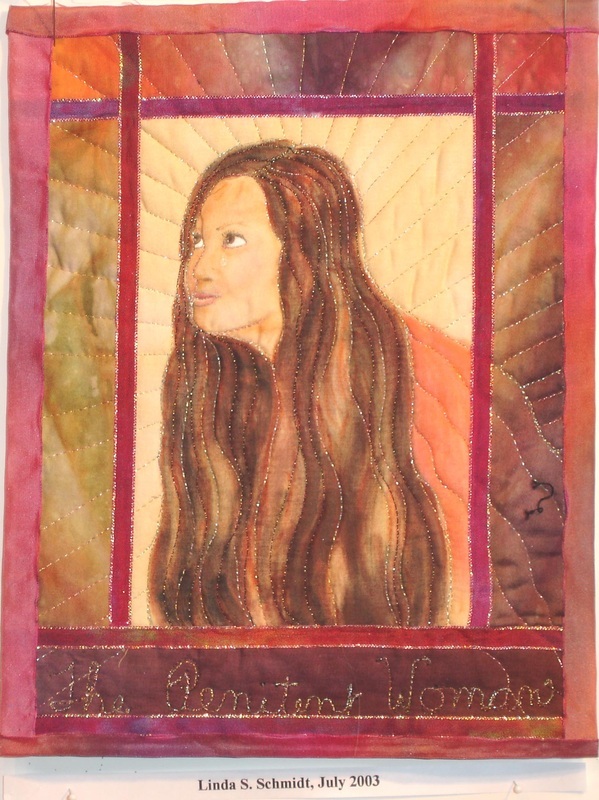 July - I got involved in the Women of Biblical Proportions Challenge and created this Penitent Woman quilt. 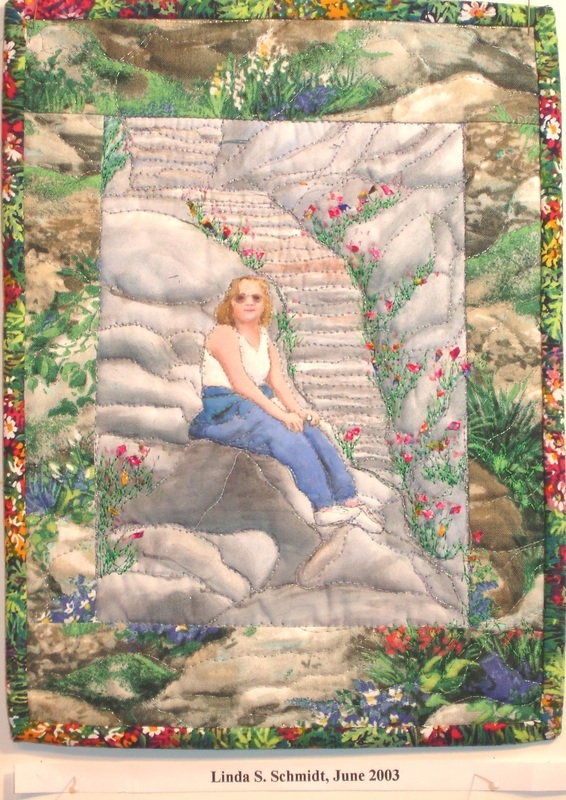 In the real quilt, I painted the woman in fabric paint on her knees in front of Christ, washing his feet with her tears and wiping them with her hair. Here, I portray only the Woman, using Tsukinecko inks instead of fabric paint, experimenting with inks I had bought at PIQF over a year ago. This piece, also, uses techniques learned in a Lura Schwartz Smith workshop. September - It’s fall. I grew up in Minnesota, and to me, the fall means just that – leaves falling. A long time ago, someone gave me these real leaves that have been treated to leave only the skeletons, drenched in copper. 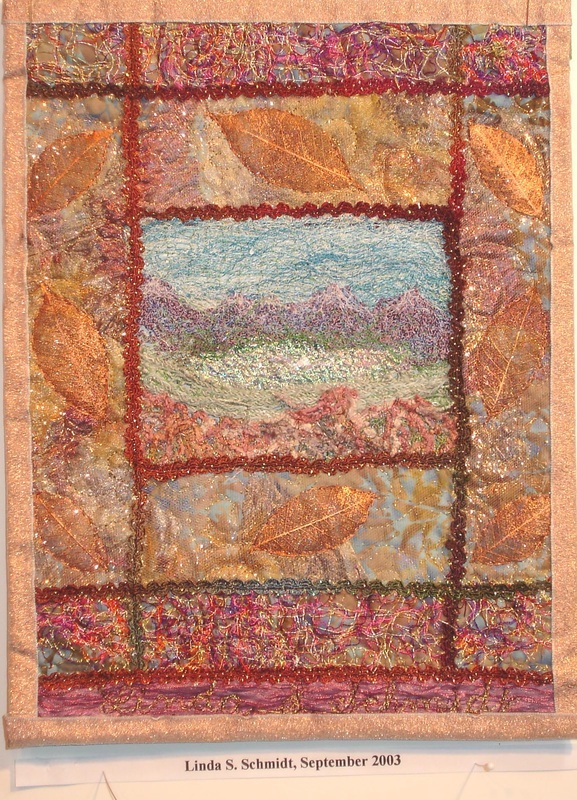 I used disappearing paper to stitch the scene, then zigzagged quilted elements together to create the borders, then added the leaves on top. Hand dyed trim was added to give some semblance of order. February - It is still cold and rainy and my brain is dead, but I have long wanted to do something with this tree that has been laying around taking up space. 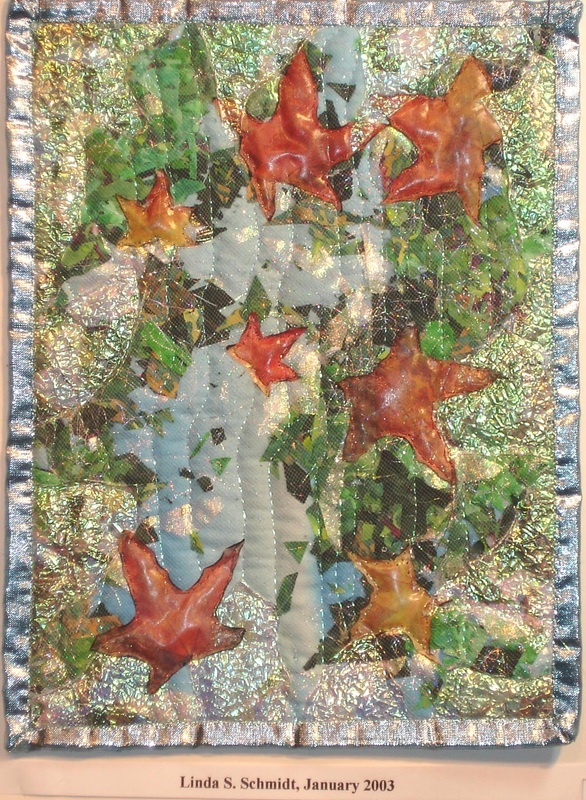 I created it in a Jan Beany class on embellishments. 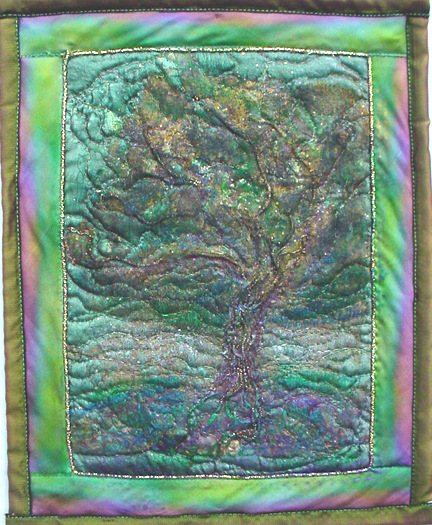 I used faceting to form the tree’s trunk and branches, then added painted melted cellophane and torn, distressed fabric to create the foliage and land tree, then laid a cheap scarf over the whole thing, then quilted it. I used iridescent paint sticks to enhance the colors and dim the glow of the gold faceting. April - I bought the New Drawing on the Right Side of the Brain and The Secrets of Drawing Realistic Faces and a whole bunch of cool drawing stuff, and taught myself to draw. This hand is an exercise from one of the books, but it is also a reminder. One of my students told me that, as a teacher, she felt I “put the knowledge in her hand,” which I think is the most important thing for a teacher to strive for. 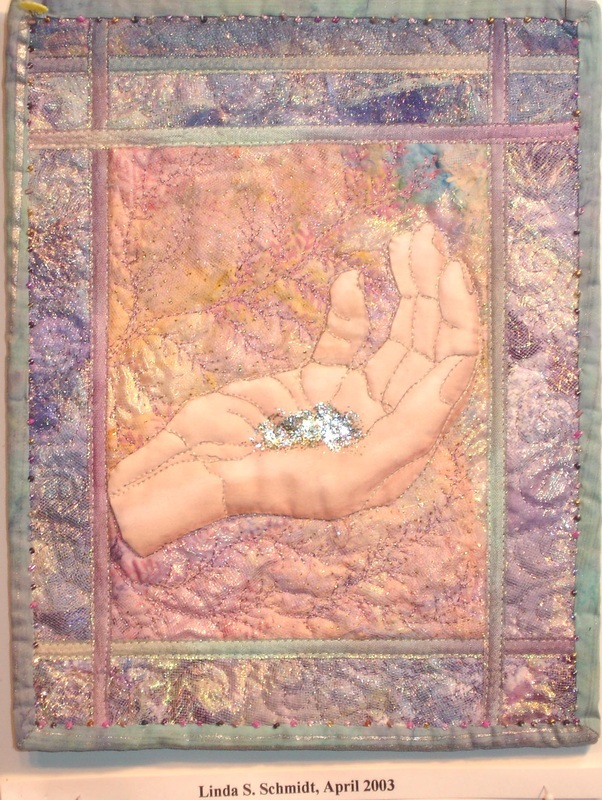 The background is tulle, Angelina fibers, and distressed opalescent organdie fused together with Bonding Agent 007; the glitter signifies the sparkling wonder that is knowledge. June - My husband and I decided to take a walk at Yosemite on our 31st anniversary. I almost didn’t make it back from that 18 MILE walk since my right leg gave out and we got lost deep in the woods with all the bears and wild cats and coyotes and wolves, with only 4 bottles of water and two croissant sandwiches between us and starvation. Did finally make it, after crossing 20 feet of icy Yosemite Creek TWICE, then spent the night in a Mongolian Yurt. Quite a memorable Walk in the Park, painted with Pebeo Setacolors. August - I took a class from Lura Schwartz-Smith in the techniques involved to create portraits using Tsukinecko inks. Using Xpandaprint, I printed with rubber stamps on border fabric, then painted that with fabric paints and metallic fabric glitter. By that time, the center was boring, so I used iridescent Paint Sticks to color the background fabric, then used Galactica fabric glitter paint to add sparkle.